It’s a nice fall day here in Colorado and I’m finding this to be a rare morning of opportunity. 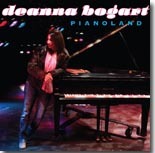 What better way to start the day then to have the fireplace burning and a copy of Deanna Bogart’s Pianoland playing on the stereo? What’s unique is that this disc is a piano only release by Deanna, there’s not an ounce of saxophone performing on it anywhere. I’ve always thought that D was an underappreciated piano player and now that I’ve heard this disc, I would have to agree with Tommy Castro’s recent prognostication on Blues Cruise #19, ”it’s time for Deanna Bogart to win a Blues Music Award for her piano playing!” Now let’s see if I can do a good job explaining why, time to hit play. Deanna opens with “In the Rain,” a tune about the ups and downs of existence but always knowing that at the end is something worthwhile. “I don't know what's in store…but like love washed ashore…a pearl will still remain…in the rain!” Deanna is back by her usual stellar cast of characters, Mike Aubin on drums, Scott Ambush on bass, Dan Leonard on guitar and Jeff Reed makes an occasional appearance on the upright bass. Deanna has played with this supporting cast for a long time now and their tightness as a band really shows. D’s musings on life continue in “On And On And.” “Maybe it’s the world…maybe it’s just me…maybe it’s just the way things are supposed to be.” I’ve always known Deanna to have an inquisitive view of the world and this tune is another example of that. What follows next is an instrumental, “Boogie Woogie Boogie,” composed by Earl Garner is up next and Deanna leads the way with some very inspired work on the keys. Up next is “Couldn’t Love You More” and here we find Deanna sharing her love and heart with another, showing her support in the hard times. “What it takes to heal the breaks…is worth a love that’s true…I just know when your heart aches…that mine does too!” “Where the Well Never Runs Dry” is probably my favorite tune on Pianoland and it's Deanna’s comment on the power of perseverance. “I’ve always believed that whatever I need…is somewhere here inside…but lately I don’t have enough…or is it just that I…gotta go deeper where the well never runs dry?” Exploring our limits is part of the human condition and everyone will be surprised at just how deep their own well runs! I’m happy to hear Jeff Reed’s upright bass in Deanna’s take on out next tune, the Willie Dixon classic, “I Love the Life I Live.” “Just please forgive me…if you will…I live the life I love…and love the life I live. Deanna has the throttle wide open on our next instrumental, “Death Ray Boogie,” before segueing into a classic tune from the Wizard of Oz, “Over the Rainbow.” Those of us old enough to remember the original by Judy Garland will appreciate Deanna’s take on the song she made famous. “Somewhere over the rainbow….bluebirds fly…birds fly…over the rainbow…tell me why or why….can’t I?” You can Deanna, you definitely can. Pianoland closes with another amazing instrumental, “Blues at 11,” and the James Taylor tune, “Close Your Eyes.” In my mind’s eye I can see Deanna at the piano in her music room at home, late at night, working out the chord progressions for “Blues at 11” and not going to bed until she’s finished. The same attention to detail serves her well in “Close Your Eyes.” “So close your eyes…you can close your eyes…it’s alright…and I don’t know no love songs…and I can’t sing the blues anymore…but I can sing this song…and you can sing the song…when I’m gone.” Fortunately for all of us, we’ll have Deanna and her band around for a long, long time to come. Pianoland marks Deanna’s return to Blind Pig Records and you can grab a copy of this wonderful disc from Deanna on her website, www.deannabogart.com, or the Blind Pig site at www.blindpigrecords.com. And when the nominations for the BMAs come out, if Deanna’s name is amongst those nominated for the Pinetop Perkins Piano Player of the Year Award…give this disc a listen and then vote your conscience…let’s see if Tommy Castro is a true teller of fortunes!